Impact-A Crete-Off is a liqiuid compound alternative with no odours or fumes and is 100% biodegradable. It attacks the portland in cement, completely dissolving the hardened cement to a mushy substance that is completely rinseable with high-pressure cold water. Crete-Off can be used to remove cured cement, concrete, mortar and grout from any surface. Contains no sulphuric acid, no muriatic acid, no hydrochloric acid and no phosphoric acid. Use to clean concrete off aluminium window frames, windows, timber decks, concrete tools, ready-mix trucks, screeds, form work, concrete saws, trowelling machiines and more! 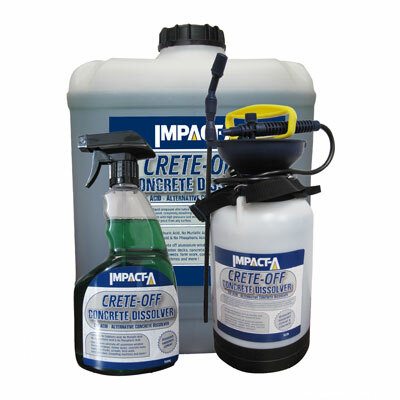 To buy IMPACT-A Crete-Off Concrete Dissolver , please use the Store Locator below.